If you’ve got a job to do, the new Haulmark ALX is the way to do it. 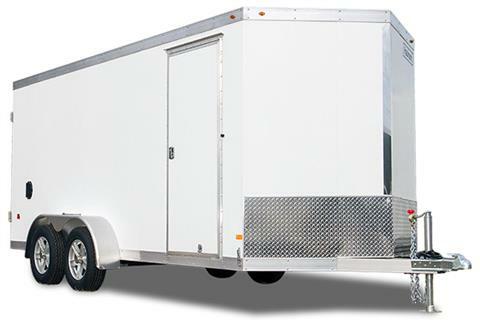 All-Aluminum construction results in a lighter trailer for increased fuel economy and increased hauling capacity. And, the Haulmark ALX won’t rust even on the saltiest roads, so your trailer will keep looking great job-after-job, year-after-year. The Haulmark ALX features a tube perimeter frame and fully integrated sidewall and roof design that delivers commercial grade durability. Be sure to check out the innovative “Overlock” roof design — an industry first. This pioneering design provides superior weather tightness that is both screwless and seamless. Beauty and brawn in one easy to tow lightweight package! Main rail - 2 x 6 in. Body - 18 ft. 5 in. Overall - 8 ft. 6 in. Body - 8 ft. 5 in. To top of ball - 18 in. ATP Stoneguard - 24 in.